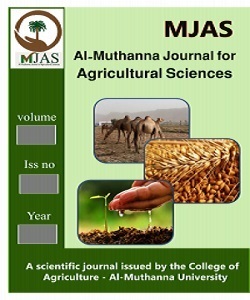 Effect of agricultural medium and several concentrations of the IBA Auxin on rooting and vegetative growth of carnation (Dianthus caryophyllus L) var Williem Sim. A factorial experiment was conducted in the nursery under plastic cover during the season 2009/2010 to investigate the effect of 4 agricultural media (reverine mixture, peatmoss, mixture + peatmoss and mixture + peatmoss + perlite) and 4 concentrations of IBA (0, 1000, 2000, 3000 ppm) and thier interaction on the rooting of cuttings and vegetative growth of Dianthus caryophyllus L.var Williem Sim by using.C.R.D design with 3 replicates. Results showed that the agricultural medium , IBA concentration and thier interaction had a significant effect on the rooting of cuttings and vegetative growth of plant.The highest average of the percentage of rooting cuttings, root number, sprout length, leaves number/plant and leaf area were achieved at the interaction of 3000 mg IBA.l-1 X peatmoss up to 100 %, 11.50 root , 17.62 cm , 17.74 leaf and 3.50cm2, respectively, while the (reverine mixture without auxin gave the lowest average which were 10.00% , 1.67 root, 4.11 cm , 4.08 leaf and 1.23cm2, respectively. نفذت تجربة عاملية في المشتل وتحت الغطاء البلاستيكي خلال الموسم 2009/2010 لدراسة تاثير اربعة اوساط زراعية هي (الزميج النهري ، بيتموس فقط ، زميج + بيتموس و زميج + بيتموس+ بيرلايت) ، وأربعة تراكيز من الاوكسين IBA هي (0 , 1000 , 2000 , 3000 ملغم. لتر-1) والتداخل بينهما في تجذير العقل وصفات النمو الخضري لنبات القرنفل صنف Williem sim باستعمال التصميم ا العشوائي الكامل (C.R.D) بثلاثة تكرارات. اظهرت النتائج ان لعاملي الدراسة والتداخل بينهما تأثيرا معنويا في تجذير العقل وصفات النمو الخضري للنبات وكان اعلى معدل للنسبة المئوية للعقل المجذرة وعدد الجذور.عقلة-1 وطول النمو الخضري وعدد الاوراق ومساحة الورقة قد تحقق عند تداخل معاملة العقل بالاوكسين IBA بتركيز 3000 ملغم/لتر مع للوسط الزراعي البتموس والذي بلغ100 % و11.50 جذرا و17.62سم و17.74 ورقة و3.50 سم2 على التتابع ، في حين اعطى الزميج النهري لوحده من دون المعاملة بالاوكسين اقل معدل لهذه الصفات بلغ 10% و1.67 جذرا و4.11 سم و4.08 ورقة و1.23 سم2 على التتابع.